Are you always forgetting your logins, usernames and passwords? Do you have lots of sticky notes or labels around the house to remember them? Would you like to find a better way?Paws-itively Puppies is a secret password book that is disguised as a paperback dog photobook. Add all your website information in one handy place to organize your internet life. The attractive design is a password journal with a difference. It was created so that opportunist thieves won't know what it is at a glance. This means that you can hide it in plain sight on your bookshelf at home with other books.What you can expect from this internet password organizer:Tabbed effect alphabetical pagesAre you looking for a password book with tabs? 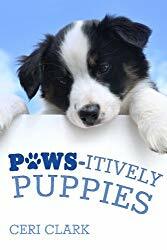 Paws-itively Puppies is a puppy book with alphabetical tabs running down the right page. For an added bonus, if you flick the pages, paw prints run down the side of the page as the tabs disappear.Attractive puppy theme throughout the bookGet some puppy love with puppies on every page. This password organizer doesn't just have a cute cover but there are adorable balls of fur looking at you imploring you to love them all through the book.Disguised cover to make it not so obvious what it contains There are several password logbooks on the market but this one was created so it could be hidden in plain sight. It looks like a photobook from the outside but inside there are gorgeous puppies playing around 3 boxes for your login information on each page.Section on creating secure passwords There are risks to however a password is stored. These can be from online thieves or opportunist burglars. At the front of the book is a brief section for creating a secure password that can be written down but can't be used by someone who has the book.Notes and other pages to add other useful information like software licensesThere is a section at the back to add information that won't fit in the usual password boxes. There are notes pages but also places to add home network settings and license information. If you have a friend coming around who wants to use the WiFi, just add it in here and you will be able to instantly find it when you need it.More space to write in your informationThis handy-sized password keeper is 6 inches wide by 9 inches high for more space to write in your login information. There are 3 boxes per page and 10 pages per double letter.If you are looking for a password logbook that is a bit different and you love dogs, look no further. There are puppies galore to make you smile as you write down your usernames and passwords. Paws-itively Puppies is part of the Disguised Password books series which include:5.06 x 7.81 (Pocket-size) Foal Play by Ceri Clark (horse book) Password by Ceri Clark (technological thriller) Broken Hearted by Ceri Clark (victorian romance) 6" x 9" (Mid-size) These are animal themed password books Meow-nificent Kittens by Ceri Clark Paws-itively Puppies by Ceri Clark Birds: A Secret LIfe by Ceri Clark Find your Hoppy by Ceri Clark Horse Play by Ceri Clark The Secret Lives of Cats by Ceri Clark8.5" x 11" Large format Diesel Engine Repair Manual by Ceri ClarkFoal Play by Ceri Clark Knitting for Beginners by Ceri Clark Secrets of the Freemasons by Ceri Clark Whittling: Carving for Beginners by Ceri Clark For more advice on security, please take a look at A Simpler Guide to Online Security for Everyone by Ceri Clark.